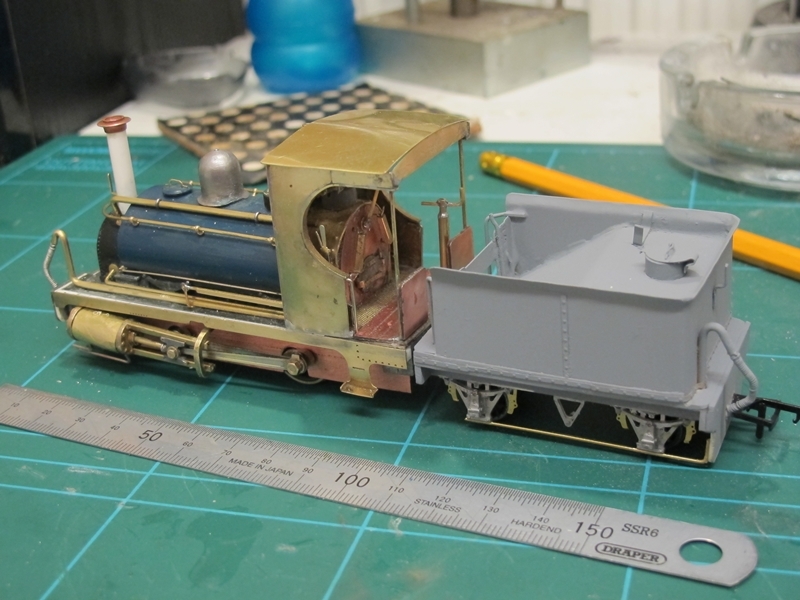 Work continues on building locomotives and stock for my 7mm scale narrow gauge project. 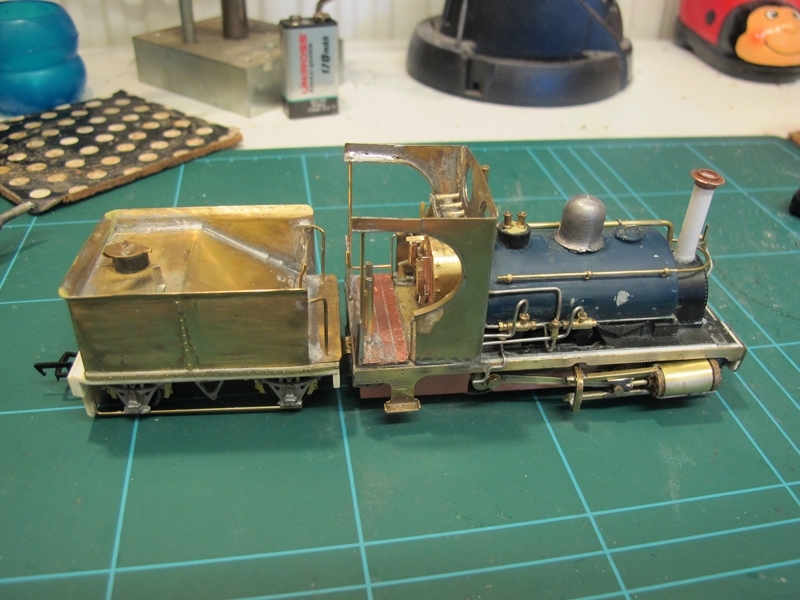 Here's the latest progress on Loco No 4 "George" a 0-4-0 tender loco. Believe it or not this loco started life as a Hornby "Caledonian" Pug! although there isn't much left of it. It now boasts Romford drivers with outside fly cranks and a load of other detailing some of which still has to be added. All the brass bits are scratch built cut from 15 thou brass sheet. The view from the driver's side. The tender now has a coat of grey primer. and the brass has been cut and shaped for the cab roof, but not yet fixed in place as more cab detail needs to be made and fitted first. More on this and other work on my 7mm narrow gauge project soon. Being of Scottish origin and all that it implies with regards to being frugal with money I like to do things "On the cheap" so to speak. Not that I skimp on quality mind, I just don't like paying out mega bucks for things I can do myself for very little cost. I use plastic card quite a lot for buildings and some rolling stock construction and one of the things I find a pain to do is marking out lines parallel to the edge of the sheet before cutting. Thinking about a way of making the job easier, quicker and more accurate I came up with this. Made from odds and ends out of my "junk" box this simple marking gauge has found lots of use when marking out Plasticard and even brass sheet. The results are repeatable so marking out quantity parts is a snip. The point scribes a nice score line so when I come to use the craft knife the blade follows the scribed line without wandering off. Great stuff! Another useful tool I find is a series of sanding blocks. Just off cuts of ply or softwood with various grades of abrasive papers attached using double sided sticky tape. Just great for squaring up or trimming plastic or brass sheet to size, shaping corners or cleaning up stuff when soldering or gluing together. More simple home made tools in a future post. 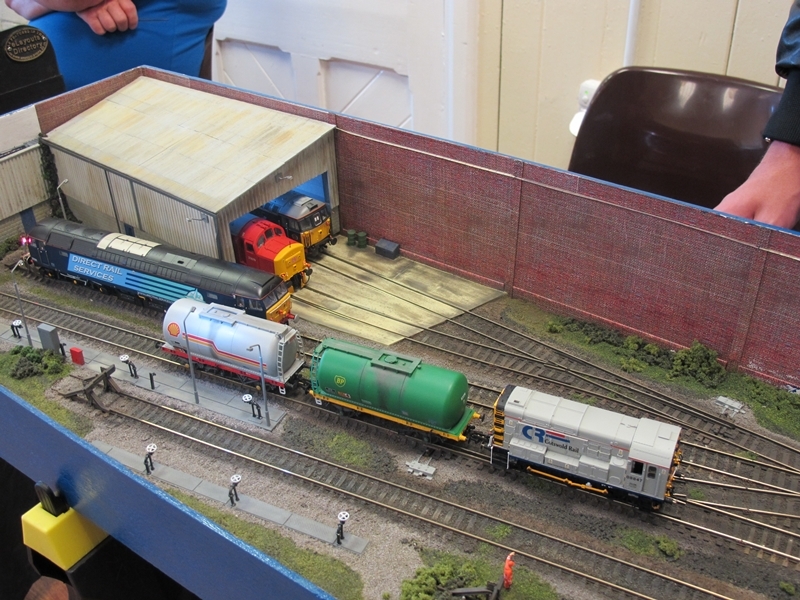 Cradley Heath Exhibition show report. Well, it's all over bar the shouting! Cradley Heath MRC's very FIRST exhibition took place last Saturday the 19th October. Not only a first for the Cradley Heath club but also a first for me as exhibition manager. Was it a success? the answer is a resounding YES! attendance reached beyond the 400 mark, that's more than I expected. The layout owners/ operators were more than happy and want to come again with different layouts. The traders went away happy and smiling so we must have got something right. I was kept busy most of the day but managed to get near a few layouts to take a few pictures. Here they are. Smoghampton By Ned Williams in Gauge 2 (Historical layout and models) I invited this layout because of it's unusual scale and gauge and historic value. Much Murkle by Nick Wood. Ok so people may say it's just another cliche GWR BLT But, look at the workmanship, the detail and the presentation of this superb layout and you can see why it's going to go on the exhibition circuit. Little brickhill by Steve Kesterton. 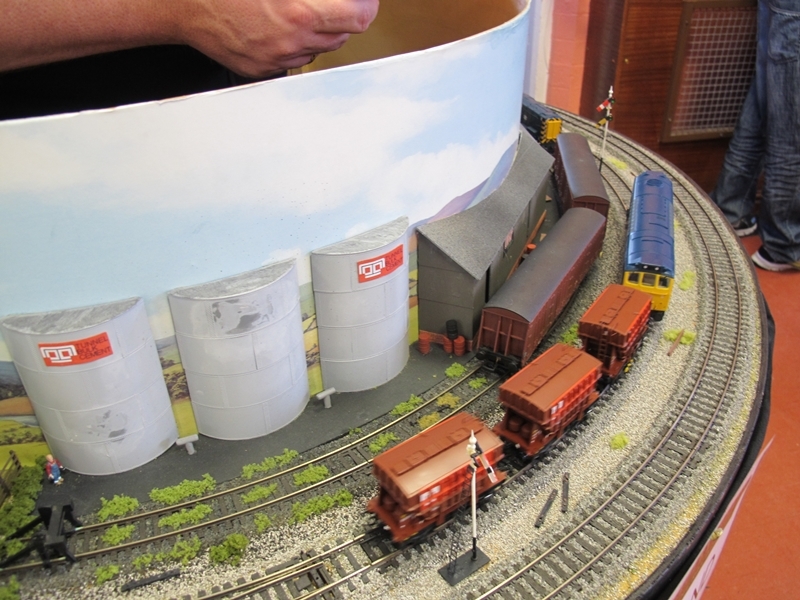 Invited to our show because it was unusual being round and at only 4ft diameter shows that you CAN have a 4mm scale roundy roundy layout in a small space and NOT look like a train set. I was a bit late booking this so it had to fit into a corner, but it deserved to be viewed from all sides to be appreciated. Spinners End 0 Gauge by Mike Bragg. The last public appearance under the builders ownership and named after the REAL Spinners End located within 100yds of the exhibition venue. Just got to have this sort of layout. Dudley Road by Pete Harvey. Again Peter offered us two nice 4mm scale layouts of local interest and something a bit more up to date than the other stuff at the show. We gladly accepted Pete's offer as I have always liked this layout. There we have it for now. I'll try and post more as and when I get time to do it. 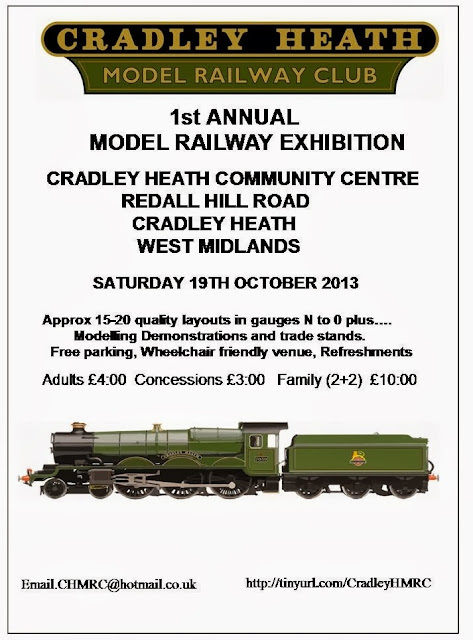 Just under a week to go to the Cradley Heath Model Railway Club's first ever exhibition! As exhibition manager I have had a very steep learning curve, but for the most part it has been a pleasant experience, so much so that I have been stupid enough to carry on for next years event. This year though, being our very first exhibition we have stuck to a one day event just to test the water. The success or failure of this years show will determine if we increase the show to two days next year and whether or not we change to a larger venue. The traditional "Big Lump of home made cake" tea and coffee is available all day. See you there next Saturday? Now that "Steam on the Cambrian" is up and running and just needs some extra bits of detailing adding to it, it's time to consider what I am going to do next. Regular readers of this blog will already know that as well as having a "fetish" for all things Cambrian I also have a yearning to build 7mm scale narrow gauge stuff. Having already built a few locos and some stock I'm going to need something to run them on. I've been having a play about with "Anyrail" track drawing software and came up with a few ideas, most of which ended up in the laptops re cycle bin! However one design seems to have survived the delete button and that is this one. 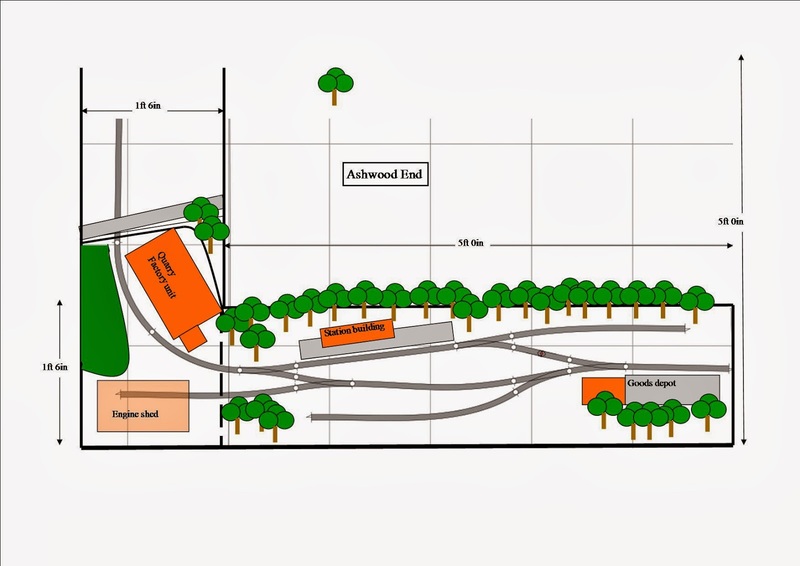 0 gauge layout of Stourbridge Model Railway Society. Ashwood being a district right on the edge of the local green belt on the West Midlands / Staffordshire border This could all change of course as nothing is yet set in stone. I want to try and avoid the Cliche of Welsh narrow gauge but, it could still happen. It is proposed to build this new layout on 2 5ft x 18ins boards set at right angles. The fiddle yard being to the left rear on the above plan. Most traffic on the line would have been Sand and gravel from the local sand quarries. 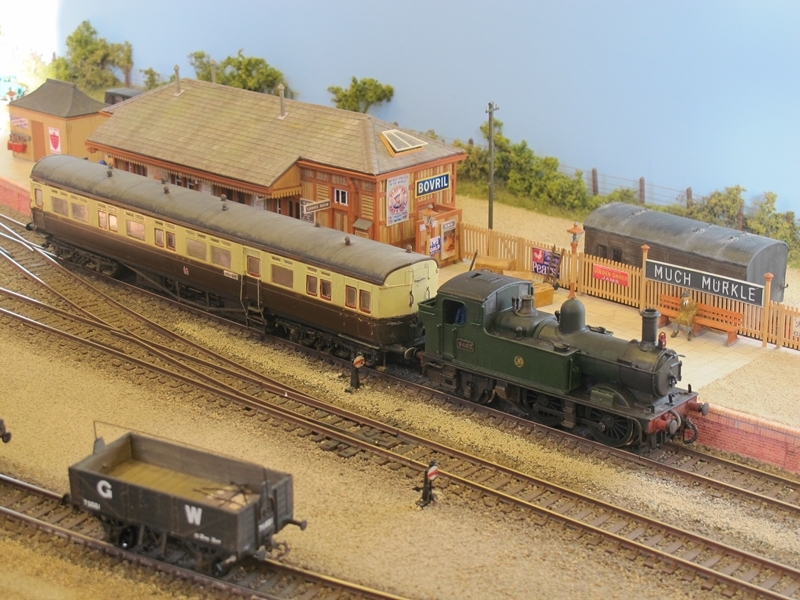 The layout is set in recent times where it has been assumed that the line has been taken over by the preservationists and is running a regular tourist passenger service as well as the lines own works traffic.So there you have it! Just need to get some materials and then I can make a start with some wood butchering! More on this as progress (if any) is made and there is something to show. Steam on the Cambrian the first outing! Last Saturday the 28th of September saw myself and my assistant Jaymes (The new face of Modellers Mecca!) 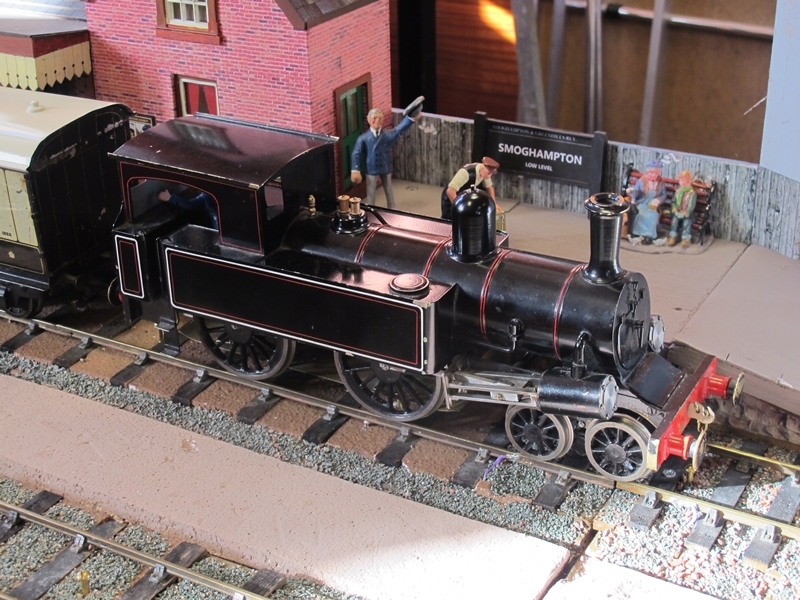 take "Steam on the Cambrian" to Telford MRG's annual exhibition. As this was the layout's very first public appearance there was always that nagging feeling that something was going to go wrong, I was going to forget something like all the stock or the power pack or some other equally important bit. No worries on that score i did manage to remember everything. Setting up took less than 30 minutes as the layout just rests on 4 adjustable light weight steel trestles and joins together with dowels and over centre clips. Not a single nut and bolt required. Operationally things went fine, just a few odds and ends to add to the snagging list. A couple of trees on the Penmaenpool section need some surgery or replacement as they foul the loading gauge on the odd vehicle passing by. 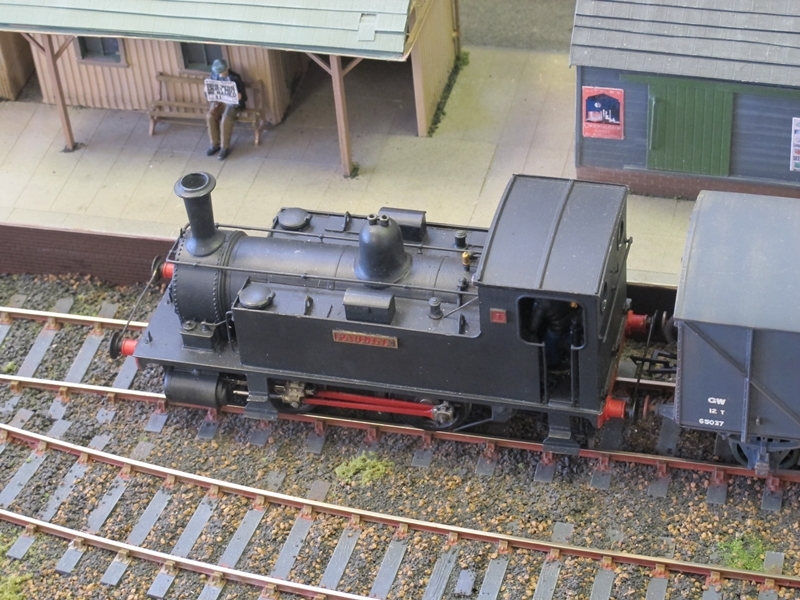 The only other niggle is with just one of the six fiddle yard tracks. There seems to be poor electrical contact between the fixed part and just one turntable track at the Morfa Bach end. Something we could work around but will need looking at before the next trip out. The Advanced starter signal on Penmaenpool also decided to play silly buggers and started sticking. I have been thinking of changing the operating method from solenoid to servo motor anyway and this episode has forced my hand. Just a couple of pictures for you. Jaymes bought along his model of a Ruston Bucyrus shovel on it's low loading truck to add a bit of operational interest. Little Ivatt 46520 and two ex LMS coaches form an authentic local train for the period modelled. This consist could usually be seen on the Barmouth Dolgellau shuttles in the early 60's before that section of line closed in 1965. The layout seemed to go down well with the punters especially the ladies! Most of whom were more interested in the scenic details than anything on the track. A couple of prospective invites to other shows were received too (details once confirmed) so all in all a good show as far as The layout and myself was concerned.